Thereâ€™s no question that the past few years have been very tough for most businesses and unfortunately, there have been a number of companies in our field who have gone out of business. Because of this, there are a lot of customers, for those businesses, that can no longer receive support for their duplication or disc printing equipment. As a consumer, I can only imagine how frustrating and isolating that this can seem. 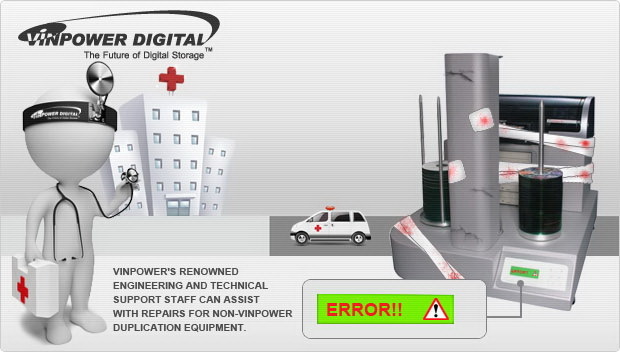 Fortunately, Vinpower has been able to navigate the rough economic tides and has one of the leading technical teams in the industry. Because of Vinpowerâ€™s inherent understanding of the full range of duplication and printing equipment, even equipment sold by competing companies, we can provide exceptional support of products that can no longer be serviced by their original supplier. So if you find yourself with product that needs service and donâ€™t know where to turn, contact Vinpower to see what options we can provide.